It’s the perennial challenge for prefab home builders: Most modular homes’ narrow floor plan and 8-foot-tall ceilings offer limited design options. The boxy configuration works for functional areas such as bedrooms and bathrooms, but doesn’t lend itself to open, light-filled living spaces that many affluent home buyers crave. 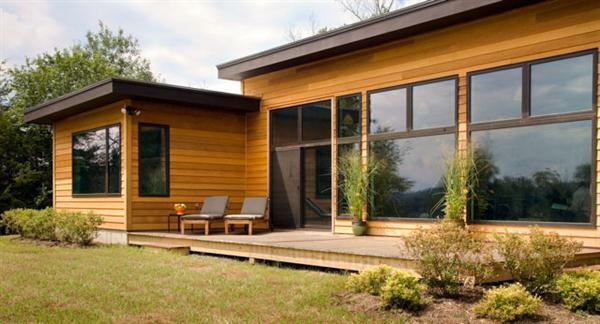 To solve this dilemma, developers Scot Cohen and Brenden Maloof devised a hybrid approach for their modular Modern Cottage prototype, a 2,700-square-foot cedar-clad showpiece in Acram, N.Y. The project team maximized the efficiencies of computer-controlled factory construction while also building parts of the dwelling on site. The duo worked with Joel Turkel, an architect and MIT instructor who specializes in prefab design, to come up with a floorplan that would push the design limits of factory-built components while capitalizing on their efficiencies. Two 15-foot-9-inch-wide modules were shipped from Epoch Homes’ New Hampshire plant and set on an insulated concrete slab. The 50-foot-long lower module containing a master bedroom, master bath, stairway, and mechanical room was topped by a 54-foot-long upper level containing two more bedrooms, a den, and bathroom. Each unit was pre-fabricated with plumbing, electric, HVAC infrastructure, and even ducting for a central vaccum system. This factory-built approach yielded a 50 percent reduction of building material waste compared to site built practices, Maloof says. 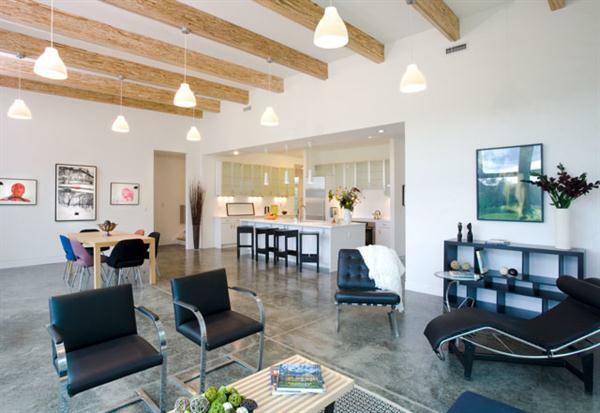 For a dramatic living space, the project team constructed stick-built walls on site to enclose the two modules with a custom 31-foot-by-31-foot entry, living room, and kitchen combination. The space features 12-foot-high ceilings and is surrounded by a wall of south-facing windows that look out onto the rural site. Maloof and Cohen upped the sustainability quotient with insulation levels rivaling that of high-performance stick-built homes, which helped to earn an NGBS Emerald certification. 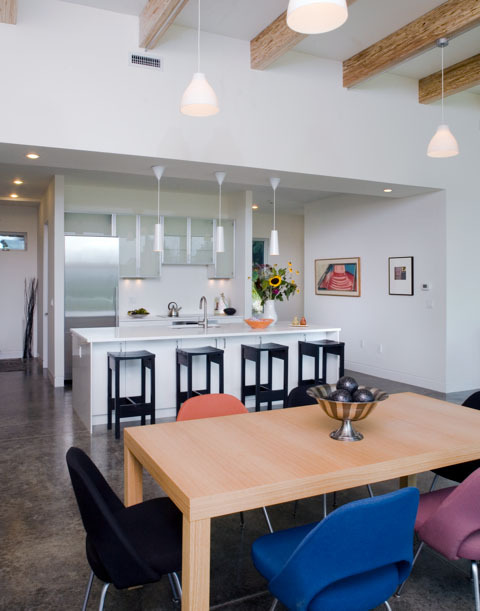 Unlike most factory-built homes that have few climate-specific features, the Modern Cottage was carefully designed for its Northeast location. It is insulated to practically Passive House levels, with an R-48 SIPS roof, a thermally broken insulated concrete slab foundation, and R-21 thermally broken walls. --High R-value, double-pane Serious Windows with thin-film technology. --Studs and headers were constructed using the Enviro-Wall framing system from Nordic Engineered Wood with built-in thermal breaks.